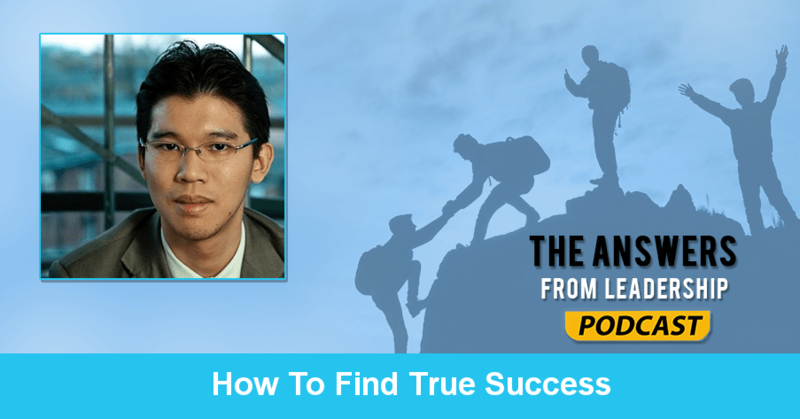 The guest for episode 29 of the Answers From Leadership podcast is Michael Teoh. Michael is a global speaker, consultant, and trainer whose passion is geared towards developing the human potential for success. Michael founded Thriving Talents Pte. Ltd, co-curated TEDxKL and TEDxYouth from 2009-2014, and was appointed as a Global Advisor for Microsoft’s YouthSpark Initiative. I’ve been able to travel the world, doing what I love. I’m also the co-author of the Potential Matrix. Success is rather subjective. In our world today, a lot of people fall into the trap of thinking success is all about money. I have 2 mentors. Both of them could be considered highly successful. One of those mentors is making a million dollars a month. Yet he has health conditions and major concerns. He may be successful with income but is he really successful with life? One of the traits of highly successful people is that we work extremely hard. We also work extremely smart. You mentioned your two mentors view success differently. How does that play into your view of success? What I’ve learned is a 3 step process on how you can define success. Number one, I believe success comes from your personal satisfaction by getting in touch with your personal purpose. Step number 2 is how do you now find a way to sustain that drive, that purpose in life. The third step of success is to find inner balance. This means that when you’re chasing success, often times people sacrifice a lot of their downtime or time with their family. That’s when you find a lot of successful people and entrepreneurs burn out. Never ever forget to visit the softer parts in life. Do you have any tips on how to put yourself and your family first as you’re building your success? This is a very common problem. I’ll be honest, I even have this problem. Leaders often say I don’t have the time or work calls. One of the things that I’ve learned from my mentors is that you can always make time. There’s a habit you need to have. That habit is to be absolutely disciplined, not in doing your work, but to be absolutely disciplined giving yourself time off. Now, when you block off this time, do you have it blocked off as an aside or is it a dedicated time off? Yeah, it’s a do not disturb me time. If you want to disturb me, it has to be something fun. It has to be something creative. Marking your rest time on the calendar isn’t about letting other people know you’re resting but reminding YOURSELF you need to rest. You mentioned that serendipity moments come in the resting times. Can you share a serendipity moment you’ve had? In the year 2011, I had the opportunity to win a competition where I won an all expense paid trip around the world. What happened as I traveled around the world, I found out that there are some remarkable young people. These are young entrepreneurs. These are people who are your young advocates. These were the people who were vying to be the youngest senator in your administration. I find that you have all these young people but they all work in silos. They do not have the avenue to share how they became who they are at such a young age. I started thinking “What can I do?” I realized no one was asking these young people how they accelerated their success and cut their time to success in half. What do you wish you would have known about success in your early 20’s? The first thing I would say is that when I was in my early 20’s, I was studying in New Zealand. I started marketing at international businesses. But, if you were to ask me to reverse time and ask me what success means to me in my early 20’s, I would say I may not have experimented enough. Success would mean starting early and experimenting. Do not silence that little voice that has been telling you what you’ve always wanted to do. In addition to your book, The Potential Matrix, what other book would you recommend to a young person looking to define success? The first book that has changed my life is by Tony Robbins. I would recommend all of you get the book Awaken The Giant. The second book I would recommend you get is a book on financial literacy. That book was written by T. Harv Eker and is called the Secrets Of The Millionaire Mind. If listeners wanted to connect with you, how would you like them to do so? I would love to connect with all of you. I’ve been talking about my book but realized I haven’t shared how to get it. You can find it at www.potentialmatrix.com. Never wait for opportunity. Instead, create opportunity. Do it over and over and over again. Question: How would you define success? Share your definition in the comment section below.